Any point-and-shoot can fit in your bag, but not every point-and-shoot can fit in your pants. The super-slim Nikon S8100, however, doesn't sacrifice power for pocketability: it shoots 1080p video; and has 10x optical zoom and 10fps full-res high-speed shooting. The Coolpix S8000 impressed us in February by squeezing a big lens on a decidedly not-big body. The S8100 scales back the megapixels from 14.2 to 12.1 with a new backlit illuminated CMOS sensor for better low-light shooting and otherwise sweetens the deal with the ability to shoot 1080p HD video and 120fps slow-mo in Sports Continuous mode. The S8100 also adds Nikon's EXPEED C2 image processing engine and 4-way vibration reducing image stabilization for the shaky handed. MELVILLE, NY (September 8, 2010) – Nikon Inc. today announced the COOLPIX S8100, which offers a 12.1‐megapixel backside illumination CMOS sensor to provide consumers with enhanced performance and outstanding image quality for high‐speed shooting and low‐light conditions. Fast, responsive and versatile, the Nikon COOLPIX S8100 with an incredible 10X zoom will capture fast‐moving subjects in still images and HD (1080p) movies. To help capture moments that are gone in an instant, the COOLPIX S8100 not only features high‐speed shooting at five full resolution frames at up to 10 frames‐per‐second (fps), but a pre‐shooting cache that records up to two shots before the shutter‐release is fully pressed. For extremely fast action shots, the S8100's Sports Continuous mode records up to approximately 120 fps. With Subject Tracking, the S8100 automatically tracks a designated subject by activating autofocus (AF), enabling the user to capture the best moment confidently. The S8100 also adopts Nikon's exclusive EXPEED C2™ image processing engine, which is customized to each COOLPIX model to further drive enhanced performance, outstanding image quality and HD video. Staying true to the legacy of the Style Series, the S8100 empowers users with serious performance and image quality, while remaining stylish and compact. Equipped with a 10x Optical Zoom‐NIKKOR ED glass lens (30‐300mm, 35mm equivalent), the COOLPIX S8100 allows the user to get close to the action, even when recording a movie in Full HD (1080p). For that family film producer, the S8100 features one‐touch recording, optical zoom and stereo sound recording while filming for an enhanced user experience. Additionally, users can perfect their movies in‐camera with a new editing function or snap still images while recording. "Our portfolio of compact digital cameras is designed to equip photographers of any level with the features and functions they will need for various shooting situations in a portable, compact body," said Bo Kajiwara, director of marketing, Nikon Inc. "The COOLPIX S8100 blends superior high‐speed and low‐light performance with a sleek and stylish design for a camera that is not only ready to go when you are, but one you are proud to show off." exceptional image quality even when shooting in low‐light settings. This CMOS sensor lends itself to enhanced shooting functions in dark situations, including the advanced Night Portrait mode, which reproduces night scenes and indoor portraits as the user sees them while reducing image blur. The Night Portrait mode combines consecutive shots of the background while the subject is taken using the flash, allowing challenging night scenes to be easily captured during handheld shooting and eliminating any subject movement. To further help deliver crisp, sharp photos, the S8100 features a 4‐Way vibration reduction (VR) Image Stabilization System with ISO settings up to 3200. Other functions benefitting from the lower noise and exceptional image quality of the new CMOS image sensor include an advanced Backlight shooting function with an in‐camera high dynamic range (HDR) function, which merges images of the same scene to achieve a single image with a broad range of tonal detail for a frame‐worthy shot. Additionally, the S8100's advanced Night Landscape mode combines a series of five consecutive shots taken at a fast shutter speed into a single image with reduced noise for when taking handheld shots. From romantic candlelit dinners to capturing the bright lights of New York City at night, the COOLPIX S8100 ensures that no low‐light moment will be left in the dark. The COOLPIX S8100 helps unleash the user's photographic potential with enhanced shooting and editing functions, including a new Mode Dial conveniently placed next to the shutter‐release button for quick and easy access to shooting modes. The COOLPIX S8100 also features the Creative Slider, which simplifies adjusting brightness, saturation and color tone in‐camera. Other in‐camera editing functions include Quick Retouch and D‐Lighting, giving users the ability to adjust their images during playback. To further help the process of composing and sharing photos and movies, the COOLPIX S8100 boasts a 3.0‐inch ultra high resolution (921,000‐dot) Clear Color Display with a wide viewing angle and anti‐glare coating. Additional must‐have features in the S8100 include 17 scene modes, including the Scene Auto Selector, which automatically recognizes the shooting situation and adjusts camera settings accordingly for great photos in any environment. For outstanding portraits, the S8100 features Nikon's Smart Portrait System, which incorporates a series of automatic functions including In‐Camera Red‐Eye Fix™, improved Face‐Priority AF, Blink Warning, Smile Timer and Skin Softening to flatter even the most camera‐shy subject. 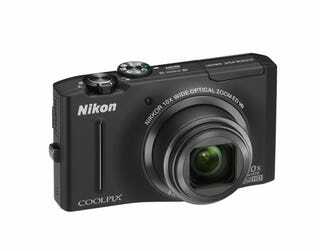 The COOLPIX S8100 will be available late September 2010 for $299.95* MSRP in a choice of attractive colors including black, red and gold.